Backs Onto Treed Area With Stream! 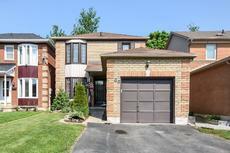 Great Family Home With Finished Basement Has Separate Living And Dining Rooms With Laminate Flooring, Kitchen Walk-Out To The Deck And Fenced Yard, Attached Garage With Mezzanine Storage And Parking For 4 Vehicles. Close To Schools, Park And Shopping.